New tank and anti-tank defense system used for the first time during a demonstration at Negev base starting ten day joint exercise. 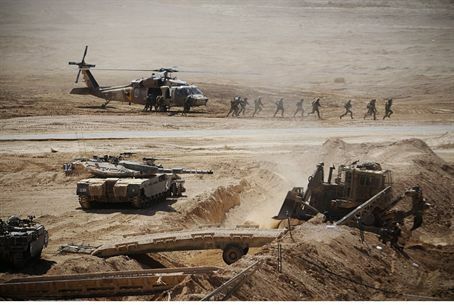 The IDF's Joint Combat Exercise held a demonstration on Tuesday at the Shizafon base, which is located in the Negev. The exercise took place in the presence of Chief of Staff, Lt. Gen. Gabi Ashkenazi, Deputy Chief of Staff, Maj. Gen. Benny Gantz, and the Chief of the Ground Forces, Maj. Gen. Sami Turgeman. The Joint Combat Exercise implements the collaboration between the different branches and corps in the IDF. Tuesday’s demonstration, which marked the beginning of a ten-day long joint exercise, focused on the abilities of the ground forces. Officers' Training School cadets from the infantry, engineering, armored, and artillery corps performed drills that combine various diverse combat techniques, including urban warfare, advancing through complex obstacles, using artillery support, and employing invasion techniques, along with aerial support of the Israel Air Force, including medical evacuations and aerial re-supplies. The demonstration marked the first time that the IDF’s Merkava Tank Mark 4 and the "Trophy" (Meil Ruach) active tank defense system were presented. Meil Ruach is a new defense system against anti-tank missiles. Its power and effect were demonstrated by the firing of a dummy missile at the tank. Chief of Staff Ashkenazi said during the exercise: “In any future conflict we will have to act quickly and in full force and transfer the fighting into enemy territory. This is a significant challenge and important decision.